*PLEASE NOTE: In order to complete this tutorial, you should have a basic knowledge of XHTML and CSS. This tutorial will only teach you how to set up all files necessary to properly create a Facebook IFrame tab, all other design and coding is up to you. If you feel that you cannot complete this tutorial, contact us in order to find out about our Custom Facebook IFrame Tab design rates. In order to create a Custom Facebook IFrame Tab you will first need to set up a Facebook Application. If you have not already created your application, do so now. 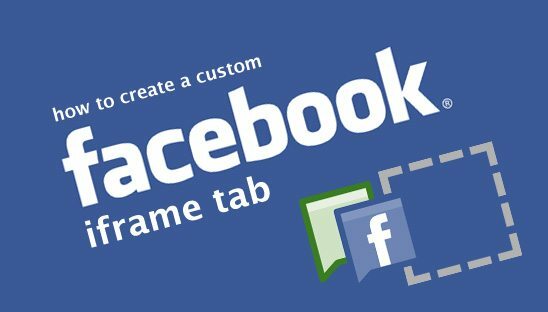 If you do not know how to set up a Facebook Application for your Custom IFrame tab, please first read and complete our tutorial ‘How to Set Up a Facebook Application for your Custom IFrame Tab’. You should now have a basic functioning ‘index.php’ file. This is all very basic HTML and anybody who knows anything about HTML should have no problems understanding what we’ve done here. Don’t forget to fill in your page title, even though it’s not necessary for your IFrame tab it’s always good practice to fill this in rather than leave it blank. Inside of the ‘head’ tag you will notice that we have linked to an external stylesheet named ‘style.css’, this will be referenced later in Step5. One item located inside of the ‘head’ tag which you may not be familiar with is the usage of ‘base target’. Since we are creating an IFrame, all links will be targeted inside of the IFrame, by using ‘base target’ and setting it to ‘_blank’ we have now told all links inside of our IFrame to link externally to new pages. There may however come a time when you need to actually have a link target inside of your IFrame but still want all other links to link externally. You can achieve this by using an individual ‘base target’ on the link you want to link inside your IFrame and setting it to ‘_self’ (**see example below). Finally, once you have completed all steps of this tutorial you will actually start creating your Custom IFrame code inside of the container div where it says ‘START YOUR CODING HERE’. *PLEASE NOTE: Make sure you use PHP files when creating your IFrame Tabs, even though we are not actually using any PHP in this tutorial, Facebook plays much nicer with PHP files. Also if you want to do something like FAN/NONFAN content you will need to use specific Facebook PHP code to achieve this (look for our tutorial ‘coming soon’ on how to create FAN/NONFAN content for IFrame tabs). Make sure you change where it says ‘INSERT YOUR APP ID HERE’ to your actual unique App ID. Your App ID can be found inside of your actual Facebook Application by logging into your Facebook account, visiting https://www.facebook.com/developers/, and then selecting your application from the ‘My Apps’ list on the right. Failure to do so will result in your IFrame tab not showing up on your Facebook Fan Page. No changes are required after inserting this code, just drop it in and you’re good to go. The CSS added to the ‘body’ is the most important; this will help ensure that we properly eliminate the unwanted scrollbars from our tab. Since our actual IFrame tab area is only 520px, you should set the ‘margin’ to 0 which will help eliminate any unwanted extra margins from being added to our IFrame. Failure to remove any default margins from your file may result in shifted or missing content when your IFrame is viewed on your Facebook Fan Page. By adding the ‘overflow’ attribute to our ‘body’ and setting it to ‘auto’ we are ensuring that our IFrame tab will properly resize, failure to add this will result in a very unstable IFrame tab. You may notice that if you are only testing your IFrame tab on a remote server and not on Facebook, when your content is long enough you are not able to scroll. By temporarily removing the ‘overflow’ attribute, while testing, this issue will be fixed. Just make sure that you remember to add the ‘overflow’ attribute back when you’re finished testing. The styles we added for the container div are only a suggestion; you may alter this in any way you see fit. It is definitely good practice to make sure that the width of your container div is set to 520px, this will help ensure that all of your content will fit within the area allowed by Facebook. Now that you have a basic functioning ‘index.php’ file and stylesheet, upload them to the location on your server that you specified in your Facebook Application for the ‘Canvas’ and ‘Tab’ URLs. Failure to upload these files in the correct place will result in a broken IFrame tab. After uploading the files, go to your Facebook Fan Page, find your tab in the menu on the left side and if all steps were completed properly you should see ‘START YOUR CODING HERE’. Now that your IFrame tab is fully functioning, you can begin your actual custom coding.